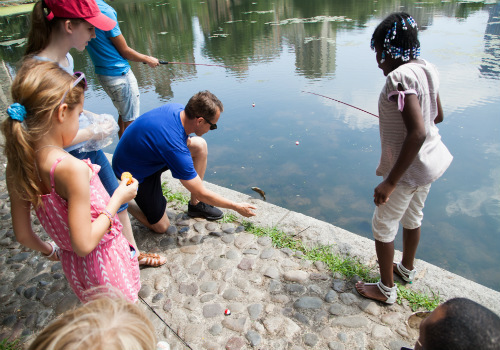 Catch-and-release fishing at the Harlem Meer has become a favorite community pastime in Central Park, and the Meer has become the preferred fishing area in the Park. Fishing poles are available to borrow at The Charles A. Dana Discovery Center, located on the north shore of the Meer. Picture ID required; instruction and bait (corn kernels) are provided with the poles. The Harlem Meer is a thriving aquatic ecosystem that supports a wide variety of fish, waterfowl, turtles, plants and microorganisms. Some of the fish living in the Meer include largemouth bass, pumpkinseed sunfish, bluegill sunfish, carp, and chain pickerel. Free for families and individuals. Reservations are required for groups of 5 or more (30 people max). Request a Group Reservation. Release fish gently. All fishing is on a "catch-and-release" basis only, meaning that all fish caught must be put back into the water immediately. Please wet your hands before handling fish, and release while the fish is underwater if possible. Use safe fishing equipment. The use of barbs on hooks, lead sinkers and overhead casting rods is strictly prohibited. Monofilament line should be properly discarded of in the Charles A. Dana Discovery Center to avoid harming wildlife. Respect the turtles and waterfowl. If you see a turtle or bird near your hook, please move to another spot to avoid catching it. Please fish with complimentary fish bait (corn kernels) from the Dana Center ONLY. The use of bread products and hot dogs as bait is discouraged as it has been found to be harmful to both the wildlife and the water bodies. Don't feed the wildlife. Feeding any other wildlife and digging for worms is strictly prohibited. Stay on pathways, ramps and steps next to the water. Excessive trampling of the natural shoreline and wading in the water kills the grass and causes soil erosion and compaction. This creates poor living conditions for plants, fish and other Meer dwellers. Visitors over age 16 using their own fishing equipment must have a fishing license. Visitors using equipment from the Dana Center do not need a fishing license. 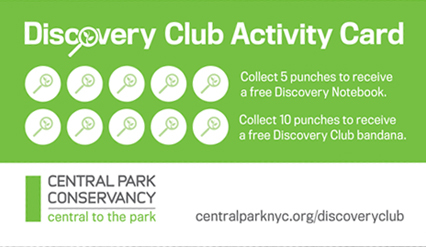 Go fishing and receive a punch on your Discovery Club Activity Card! Participate in our free family programs and collect rewards along the way.